Crimean-Congo hemorrhagic fever (CCHF) is an infectious disease endemic in a variety of countries in southeastern Europe, the Middle East, Asia, and Africa. The virus (CCHFV) transmission occurs via the bite of an infected tick and also by close contact with body fluids of infected persons or livestock. The Zika Virus (ZIKV) is an arbovirus that belongs to the Flavivirus genus and infection follows the bite of an infected Aedes mosquito, and it presents with mild flulike disease symptoms; asymptomatic infection is frequent. A ZIKV infection occurring during the first trimester of pregnancy significantly increases the probability for the fetus to develop microcephaly, a severe and disabling malformation of the brain. 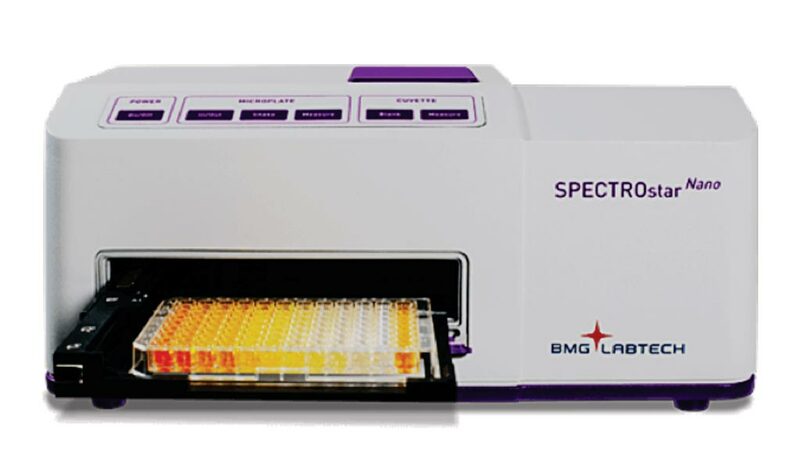 Image: The SPECTROstar Nano Absorbance plate reader with cuvette port (Photo courtesy of BMG Labtech). An international team of scientists working with the Bernhard Nocht Institute for Tropical Medicine (Hamburg, Germany) have demonstrate the potential of the bacterially expressed extracellular immunoglobulin-like domain of the human FcμR (HsFcμR-Igl) as a capture molecule for IgM-specific serological testing. As model systems, they chose two viral pathogens, the CCHFV and the ZIKV. In 2015, both were identified as high-risk emerging pathogens by the World Health Organization (WHO, Geneva, Switzerland) likely to cause major epidemics and thus needing urgent investigation and development attention. His-tagged HsFcμR-Igl was expressed in Escherichia coli and purified by affinity chromatography, oxidative refolding, and size-exclusion chromatography. Specific binding of HsFcμR-Igl to IgM/antigen immune complexes (ICs) was confirmed, and two prototypic enzyme-linked immunosorbent assays (ELISAs) for the detection of anti-CCHFV and anti-ZIKV IgM antibodies were developed. Thereby, patient sera and virus-specific recombinant antigens directly labeled with horseradish peroxidase (HRP) were co-incubated on HsFcμR-Igl-coated ELISA plates. Bound ICs were quantified by measuring turnover of a chromogenic HRP substrate. For all ELISAs, the HRP reaction product was quantified by measuring absorbance (A) at 450 nm and 620 nm on a Spectrostar Nano ELISA reader. Assay validation was performed using paired serum samples from 15 Kosovar patients with a polymerase chain reaction (PCR)-confirmed CCHFV infection and 28 Brazilian patients with a PCR-confirmed ZIKV infection, along with a panel of a priori CCHFV/ZIKV-IgM-negative serum samples. Both ELISAs were highly reproducible. Sensitivity and specificity were comparable with or even exceeded in-house gold standard testing and commercial kits. Furthermore, latex beads coated with HsFcμR-Igl aggregated upon co-incubation with an IgM-positive serum and HRP-labeled antigen but not with either component alone, revealing a potential for use of HsFcμR-Igl as a capture molecule in aggregation-based rapid tests. The authors concluded that recombinant HsFcμR-Igl is a versatile capture molecule for IgM/antigen ICs of human and animal origin and can be applied for the development of both plate- and bead-based serological tests. The study was published in the February 2019 issue of the journal Clinical Chemistry.